First, preheat your oven to 350 degrees Fahrenheit & line your muffin tins or spray them with cooking oil. In a medium bowl, mix the 2 & 1/2 cups all-purpose flour, 1 cup sugar, 1/2 cup dark brown sugar, 1 tablespoon baking powder, 1/2 teaspoon salt, 2 teaspoons cinnamon, 1/2 teaspoon nutmeg, 1/4 teaspoon ground cloves, & 1/4 teaspoon ground allspice with a spoon until the ingredients are evenly dispersed. In a separate bowl mix 1 tablespoon vanilla extract, 1 can pure pumpkin, 2 large eggs, & 8 tablespoons cooled melted butter with a whisk until combined. Create a funnel in the dry ingredients & pour the wet ingredients into the center. Mix with a spoon until combined & set to the side. In a medium bowl blend 8 ounces cream cheese, 3 tablespoons sugar, 2 teaspoons vanilla extract & one egg. Blend until combined. Fill each muffin tin 3/4 full with pumpkin batter. Top each muffin with a small dollop of cream cheese (about 1 tablespoon) & a dollop of Nutella. Use a toothpick to swirl the pumpkin batter, cream cheese, & Nutella. 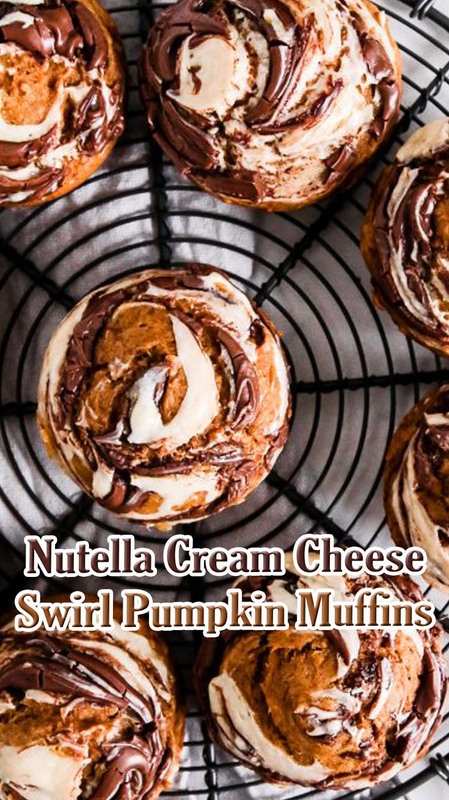 Bake your Nutella Cream Cheese Swirl Muffins for 20-25 minutes. Let cool on a wire rack & enjoy! Store extra muffins in a sealed container in your fridge for up to a week. To reheat cover in foil & bake at 350 degrees Fahrenheit for 5 minutes or microwave them as desired for 15-30 seconds.